Two Taizé brothers spent time in South Africa from 22 September to 6 October. One of them writes about their visit. 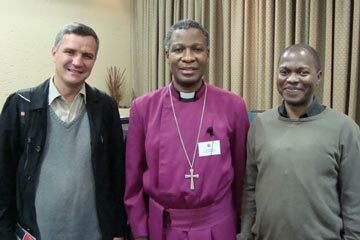 The “Centre for Christian Spirituality”, located in Cape Town, invited two Taizé brothers as guests for their 25th anniversary. The Centre was created by the former archbishop of Cape Town and Nobel Prize laureate, Desmond Tutu. Famous throughout the world for his commitment and key role in the fight against apartheid, Desmond Tutu, who is celebrating his 80th birthday this October, is a man of prayer and of deep faith. After his visit to Taizé in 1979, he felt that he should prepare a group of 144 South Africans, from various churches and ethnic backgrounds, to go to Taizé. They did so one year later. Since that time, Taizé’s links with South African Christians have grown consistently. During our stay, we were asked to lead many prayers in various contexts. It is not difficult to detect a profound thirst for God along with a deep-seated mistrust of religious institutions. 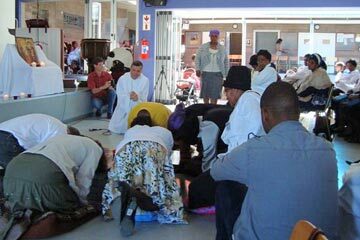 One evening in an affluent neighbourhood of Cape Town, those present at the prayer were nearly all of European descent when suddenly Isaac, from the Guguletu township arrived with ten of his friends. Isaac has just spent three months at Taizé. His presence and the presence of his friends brings a breath of fresh air and they arrive just on time to help us with several African songs. We meet up with Isaac again the following Sunday in a Presbyterian church in Guguletu. The pastor’s daughter took part in the Taizé Nairobi meeting in 2008. Her father would like us to lead the prayer. We must improvise quite a bit, but the prayer around the cross touches people deeply. The dignity of the elderly women going down on their knees and placing their forehead on the cross is poignant. Isaac and other young people are there to help them get up again. It’s obvious that they understand the profound meaning of such a prayer. How many burdens have they carried in the course of their life? At the end of the service the pastor asks us to bless all the children of the parish. What can we say about our visit to Robben Island, where Nelson Mandela and so many others spent more than twenty years of their life? The visit was well prepared by the Centre for Christian Spirituality and is part of the anniversary celebrations. There are around twenty of us from various churches and ethnic backgrounds. 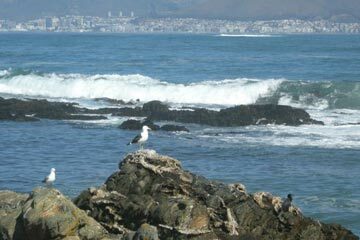 Travel from Cape Town to Robben Island takes less than 30 minutes on board a comfortable ferry. The immense suffering undergone by the black people and those who risked their lives in order to bring change is powerfully impacted on visitors to the island. One can see where Robert Sobukwe, President of the Pan African Congress, was held in solitary confinement. After a visit to the prison, we move to the lime quarry where Walter Sisulu, Nelson Mandela and so many others spent years in forced labour. After Cape Town, Johannesburg welcomes us. We spend our first night at Koinoinia, a place of hospitality, near the centre of Joburg. It is operated by the Dominican Sisters. Sister Jackie is no longer young, but she is always available to guests with great kindness. A young pastor from a rapidly growing Pentecostal church, who recently spent a week in silence at Taizé, comes to get us at 8.00am to take us to his church. Several members, including many of the leaders, have been to Taizé, seeking ways to renew worship and making more space for silence and song. We spend the morning with them. After morning prayer, which we led, we gave a quite presentation of Taizé and the pilgrimage of trust. In the afternoon we are off to Pretoria where Willem Nicol is expecting us. He too is a Dutch reformed minister, well known for his spiritual writings and his emphasis on the importance of a deeper spirituality. He welcomes us into his home. At 82, retired from parish ministry, he continues to read avidly and study the Scriptures. We are to lead the prayer with Taizé songs in an important church in Pretoria. Here, as elsewhere in our journey, we detect a true openness in the Dutch Reformed Church. Many seem to have moved beyond denominationalism and are open to gifts from other Christian traditions. How not to miss the opportunities for reconciliation afforded by this openness? It is already midnight by the time we get back to Johannesburg. Sister Jackie is waiting to open the gate. She is quite sorry for us because we have to leave before 6.00am tomorrow for a meeting with the Anglican bishops of Southern Africa. It’s a perfect opportunity to get word out about the Kigali meeting in November 2012. Our announcement generates enthusiasm. Archibishop Thabo, from Cape Town, Primate of the Anglican Church in S. Africa gives us a warm welcome. Father Ben, the parish priest of the famous Soweta church of Regina Mundi has offered to take us there and we end up spending three days with him. Father Ben came to Taizé during a time of study in Ireland. Regina Mundi played a historic role in the struggle against apartheid. Over the years, many young people from this parish have been to Taizé. The afternoon was announced as a time of reflection and prayer. We intend to speak about the meeting in Kigali as well and we finish around 8.00 pm. Only two people show up at 3.00 pm, the scheduled time for the beginning of our meeting: Benedict and Thabo. Slowly others arrived from Soweto and neighbouring townships, including Orange Farm. At 5.00 pm, thirty people have gathered, mostly young. Father Ben seems delighted to see the faces of these joyful young people. Clifford, now a Franciscan, proposes that someone write about our gathering in the diocesan newspaper and he suggests that a date be set immediately for the next meeting, which will also be a preparation meeting for Kigali. All are in favour of meeting again on October 23rd. Our meeting in Soweto ends with a simple prayer in the church of Regina Mundi. The following day, at the parish morning Eucharist, Father Ben speaks to those present about the importance of this simple prayer: just being in God’s presence, listening to God. Lucky, Thabo and Benedict have slipped away for a moment and come back with goat meat and sausage which they cook on the grill near the rectory. Our evening goes on a long time and is festive with the simple pleasure of being together. Bonds of real friendship unite us with these young people from Soweto. The next day, Thabo, who spent several months at Taizé, takes us back to the airport in Johannesburg for our flight to Bloemfontein. Just as our plane lands, heavy rain begins to fall and we are soaked in the few seconds that it takes to run from the airplane to the airport terminal. Jan Lubbe is there waiting for us. It’s a joy to be with this pastor of the Dutch Reformed Church. Last June he and his son spent a week at Taizé. It’s at his urging that we have come to Bloemfontein and we understand immediately that it’s the right decision. 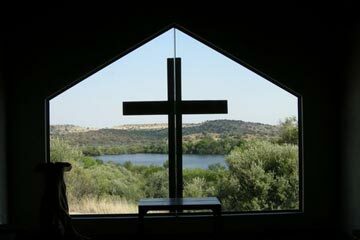 We head for Bloemfontein where we arrive late for a prayer with Taizé songs in Jan’s church. The theme is the first beatitude: “Blessed are the poor in spirit.” The next day in the same church, we take part in Sunday worship and speak about hope, and the Kigali pilgrimage of trust. Everywhere we go, the Kigali meeting generates much interest.